Easter is just over a month away. Time to start thinking about some meaningful little extras for your gatherings. 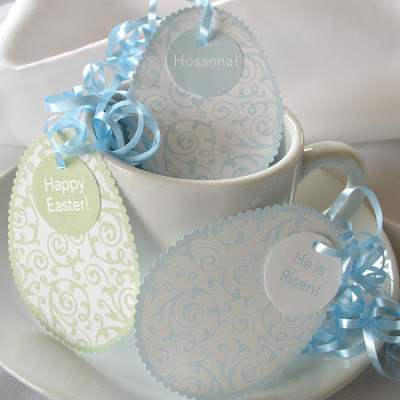 These quick paper place cards can be set out for your Easter brunch or dinner whether you're hosting 2 or 20 people. The egg symbolizes the new life we have in Jesus, and the message tags make it clear why we celebrate this holiday. To make: Cut out 3 in. egg shapes from patterned paper using decorative edged scissors. Print or write various phrases on coordinating solid colored paper. Cut out in circles. Punch a hole through each and string together with matching ribbon. I used: "Hosanna!" "Happy Easter!" and "He is Risen!"